Benoot after broken collarbone: This was much worse. 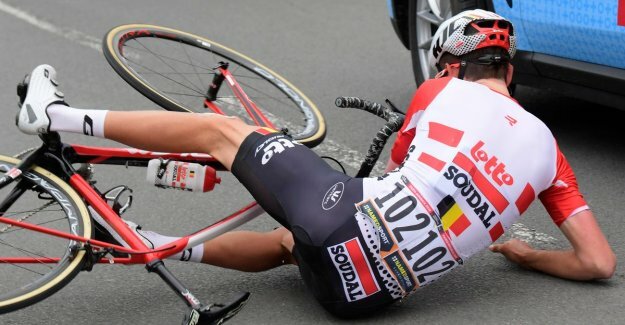 Cycling is The classic spring for Tiesj Benoot (25) in the Paris-Roubaix is brutal ended up with a complex fracture of the collar bone and a muscle tear of four inches in the rechterbovenbeen. Benoot rode in a hellish chase with a speed of over 40 km/h on the tailgate of the truck, Jumbo-Visma. Benoot splintered the rear window of the Mercedes and was very fortunate that the consequences for him are not much worse. yesterday was not yet clear how long Tiesj Benoot is inactive. “The top of the collarbone is broken. But surgery is not necessary. The recovery will certainly take weeks”, says Benoot.